Pomeranians may be small, but they have a large amount of energy. Releasing this energy throughout the day is essential for good physical health, for behavioral health, and for socialization. But just how much exercise should you give your Pom? For a puppy, too much exercise can affect growth, and for adult Poms too much exertion can cause the body too much wear, especially on the joints. But too little exercise can result in poor health and behavioral issues, and we all want our dogs to be happy and healthy. A 20 or 30 minute walk at least twice a day is a good routine to get into. But remember that your Pomeranian has short legs, and what will feel like a quick pace to him, will feel very slow to you. But it is his pace that is important. You need to walk at his pace. Never go running with your Pom. And after each 20 or 30 minute walk, make sure he gets water and a treat. 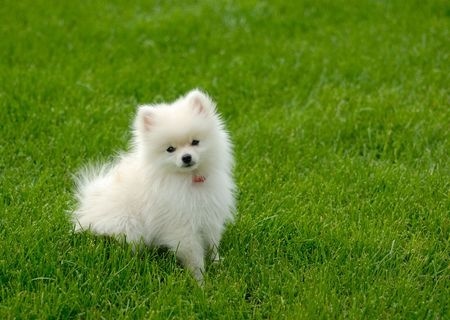 Poms can go for long walks, up to 2 hours if you like, but remember the 20 or 30 minute rule. After that amount of time take a 10 minute break complete with water and a treat. That will keep your dog hydrated and energized. Walk your Pomeranian on sidewalks or in parks, but never in the streets. You want the walk to be an enjoyable experience for both your dog and yourself. Also choose times of day that do not require you to rush anywhere. If you can, exercise your Pom when he is eager to go out. Some dogs aren’t morning animals, and some can’t wait to get outside first thing. You will probably have to reach a compromise with your dog, and find a time that suits you both. In addition, if you have a yard, you can exercise your dog out there in play. Dogs love to please, and your Pomeranian will enjoy playing games like fetch and tug with you. It is a wonderful way to deepen your bond with your Pom. So give your Pomeranian plenty of exercise. Walking about an hour or two before bedtime will help him have a nice sleep. But the main thing here is to give your dog a chance to release pent-up energy, and your Pom has plenty of that.